If this year’s presidential election is at all competitive, we will see the major candidates zero in on a handful of “battleground” states and ignore most of the United States. The red-versus-blue electoral map has changed little since achieving iconic status in 2000; all but 10 states have repeated their choice of party three times. A slight majority of the more than 3,000 counties in the United States have voted the same way over the past seven elections; at the county level, the current red-versus-blue map was mostly written by 1988, when the first president Bush defeated Michael Dukakis. See a larger version of the 1916 map. Sixty-six counties have been voting for the same party in every presidential election for at least the past century. Almost all are Republican, and the best Barack Obama could do in any of them in 2012 was the 45 percent he got in Lee County in his home state of Illinois. You can see the oldest parts of the party’s base in Appalachia, which has been especially hostile to Mr. Obama; he got less than 30 percent of the vote in every county that’s part of the “century club” in Kentucky, North Carolina and Tennessee. Also notable are Hamilton and Hendricks, the largest suburban Indianapolis counties and part of the coalition that has kept Indiana red in all but four elections since 1916. There is one blue speck in northeastern Kentucky: Elliott County, an almost all-white collection of “hollers” in the state’s coal-producing region. It has voted Democratic in every presidential election since the county was founded in 1869. For more than a century after the Civil War, Kentucky was characterized by deeply Democratic and deeply Republican counties just a few miles apart, representing the split over whether to secede from the Union. Even George McGovern carried seven Coal Country regions in 1972 while the state went for Richard Nixon by almost 30 points. But this rural Democratic base has been shrinking with almost every election and Elliott was the only county left in 2012. The blue speck will probably soon disappear: President Obama’s 49.4 percent plurality was the worst showing by a Democrat in more than 100 years. Several counties in southern Texas are now overwhelmingly Democratic because of their Hispanic majorities, but in 1916 few people of any race or ethnicity voted in Texas, and the Democratic Party pretty much ran the entire state without much opposition. The blue counties on the map are simply the ones that remained after the Democratic base in Texas melted away over the 20th century. See a larger version of the 1940 map. After three landslide Republican wins in the 1920s and two landslide wins for Democrat Franklin Delano Roosevelt in the 1930s, the G.O.P. backbone began to take shape in the middle of the United States. Wendell Willkie—the last major-party nominee without experience as a government or military leader—appealed to rural counties in landlocked states resistant to F.D.R.’s New Deal policies. 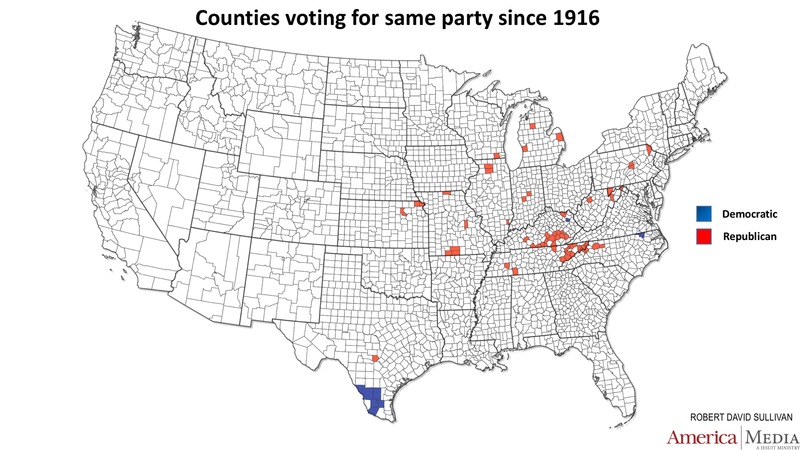 And dozens of these counties have remained resistant to the Democrats, abandoning their earlier flirtations with “prairie populists” like Democrat William Jennings Bryan. Willkie also won Orange County, Calif., the future home of Disneyland, and eventually the Republican base in the state. Its population surged during the 1950s, as Los Angeles County burst past its boundaries, and it provided the Republicans with their biggest raw-vote margin in the state from 1960 through 2004 (except for 1972), giving up the title to Bakersfield’s Kern County in 2008. Mr. Romney won it by only 6 points in 2012; the growing number of Hispanic and Asian-American voters have put it within reach of the Democrats. Less visible on the 1940 map are the urban centers of the Democratic Party. In 1928, Al Smith became the first Catholic nominated by a major party. Boston’s Suffolk County, the city of St. Louis, St. Paul’s Ramsey County and three boroughs of New York City (Brooklyn, the Bronx and Manhattan) voted for Smith and haven’t voted for a Republican since. Four years later, Roosevelt carried Detroit’s Wayne County and Duluth, Minnesota’s St. Louis County, and they’ve been Democratic ever since. Philadelphia was a laggard, supporting Herbert Hoover in his re-election bid in 1932, but it switched to the Democrats in 1936 and never looked back. See a larger version of the 1960 map. Another cluster of large urban counties has been Democratic since John F. Kennedy became the first successful Catholic nominee, including Baltimore, Milwaukee and San Francisco, plus Oakland (Alameda County, Calif.), Madison (Dane County, Wis.) and the historically Catholic area of Dubuque County, Iowa. In Massachusetts, Middlesex County became an early example of a suburban area tipping to the Democrats. The 1960 map also shows the Republican Party sinking roots in the fast-growing areas of the Sun Belt after World War II. Phoenix’s Maricopa County, home base to “Mr. Conservative” Barry Goldwater, has been voting Republican since 1952. Sarasota County, in Florida, started voting Republican in 1948, part of a cluster of conservative counties on the Gulf Coast. In Tennessee, the Knoxville area became reliably Republican after the war; in Virginia, suburban Richmond became part of the G.O.P. base. See a larger version of the 1968 map. Today’s Electoral College map starts to take shape in 1968, after we get past the most recent double-digit win by the Democrats (Johnson over Goldwater in 1974). Nine states flipped to the Republicans in 1968 and haven’t changed since. You can also see Republican red spreading in the most rural parts of Indiana, Ohio and Pennsylvania. Also turning Republican: Fort Worth’s Tarrant County, Tex. ; Colorado Springs’ El Paso County, Colo.; and suburban Milwaukee’s “crucial” Waukesha County, Wis. The big missing piece of the Republican coalition here is the South, where George Wallace carried five states in 1968 running as an independent and where Democrat Jimmy Carter won all but Virginia in 1976. It would take a few more years for the G.O.P. to dominate the region. See a larger version of the 1976 map. Running for re-election in 1972, Richard Nixon captured a slew of suburbs and small cities across the South that have never gone Democratic since, including: Jefferson Parish in suburban New Orleans; Mobile County, Ala.; Montgomery County, near Houston; Pensacola’s Escambia County, Fla.; and Chattanooga’s Hamilton County, Tenn.
Nixon also won several major urban areas in 1972, including New York’s Queens County (home of TV’s Archie Bunker). But many of them flipped to Jimmy Carter in 1976 and have voted Democratic ever since; not coincidentally, these counties lost many non-Hispanic Catholic voters during the ’70s and ’80s. Besides Queens, they include Chicago’s Cook County; Minneapolis’s Hennepin County; Cleveland’s Cuyahoga County; Pittsburgh’s Allegheny County; and Buffalo’s Erie County. Also switching to the Democrats in 1976 was Prince George’s County in Maryland, now the largest majority-black suburban county in the United States. By 2012, Prince George’s was the fourth most Democratic county in the nation—behind Shannon, S.D. ; Washington, D.C., and the Bronx in New York. See a larger version of the 1980 map. Jimmy Carter’s sweep of the South in 1976 proved to be an aberration rather than a resurgence for Democrats in the region. In 1980, Ronald Reagan flipped 17 states to the Republicans to establish what some called a “lock” on the Electoral College through the ’80s. Four of these states haven’t voted for a Democrat since. Reagan did especially well in fast-growing suburban and exurban areas. Among the places he snatched from Carter for what would be a Republican run of more than 30 years were Jacksonville’s Duval County, in Florida; suburban Atlanta’s Cobb and Gwinnett counties, in Georgia; Myrtle Beach’s Horry County, in South Carolina; and suburban Austin’s Williamson County, in Texas (now more than six times as populous as when Reagan first carried it, and even more Republican). Reagan also flipped King County, Tex., the third-least-populated county and the most Republican one in the United States in 2012—giving Romney 139 votes to Obama’s five. See a larger version of the 1984 map. With Carter out of the way and an all-Northern Democratic ticket (Walter Mondale of Minnesota and Geraldine Ferraro of New York), dozens of rural Southern counties switched to the Republican Party. The G.O.P. also took hold of York County, S.C. (a textile center where “Sherman's men launched raids as they marched through” at the end of the Civil War; and Henry County, Ga., home of the Atlanta Motor Speedway). But Reagan’s re-election landslide also saw the G.O.P. lose control of about two dozen counties elsewhere, presaging the Democrats’ gains in places with highly educated voters and significant numbers of Hispanic or nonwhite residents; they include Denver County, in Colorado; Des Moines’ Polk County, in Iowa; and Eugene’s Lane County, in Oregon. See a larger version of the 1988 map. Joining the Democratic base this year: Los Angeles and Santa Clara counties, in California; Seattle’s King County, in Washington; and suburban Washington’s Montgomery County, in Maryland. Also: Niagara County, in New York, and La Crosse County, in Wisconsin, seem to have provided tipping points, as their states haven’t voted Republican since. See a larger version of the 1992 map. Nine states that now have 148 electoral votes between them (more than half the 270 needed to win the presidency) flipped to the Democrats in 1992 and have stayed there since. Bill Clinton didn’t win a majority in any of them his first time out; independent candidate Ross Perot’s 19 percent seems to have included a significant number of voters who had supported George H.W. Bush four years earlier but would not return to the G.O.P. for decades. The Democrats’ dominance of New England, the Northeast Corridor and Florida’s southeastern Gold Coast dates to 1992. California’s switch coincided with Sacramento County turning Democratic; in Illinois, a tipping point was Champaign County; in Michigan, Lansing’s Ingham County; in New Jersey, Camden County; and in Pennsylvania, suburban Philadelphia’s Montgomery County. See a larger version of the 1996 map. Several affluent suburban counties flipped to the Democrats in 1996, when Clinton ran for re-election during a boom economy, and haven’t looked back since, including Suffolk County, on New York’s Long Island; Fairfield County, Conn.; Bergen County, N.J.; and Oakland County, Mich. Nearby Macomb County, which is more blue-collar, was the more Democratic of the two big suburban Detroit counties for decades after World War II. But it voted for Republican George W. Bush in 2004 even as Oakland County stuck with John Kerry—a striking example of how the Democratic base has shifted from union members to college graduates. But 163 counties abandoned Clinton in 1996 and haven’t voted Democratic since. The defections represented a further withering away of the party’s rural and small-town base; Clinton’s liberal social policies evidently were too much for these counties, and pro-life Democrats were becoming increasingly estranged from the national party. Switches included Murfreesboro’s Rutherford County, Tenn.; Topeka’s Shawnee County, Kan.; Owensboro’s Daviess County, Ky.; and Dublin’s Laurens County, in central Georgia. See a larger version of the 2000 map. With Ross Perot no longer around to divide opposition to the Democrats, 598 counties began a Republican voting streak this year, filling in large chunks of our map. There were only two comparable switches to the Democrats—Orlando’s Orange County, in Florida, and Charles County, Md., a fast-growing part of suburban Washington, D.C. Many of the new (or renewed) Republican counties were well outside their states’ biggest and fastest-growing population centers, foreshadowing the party’s growing appeal in “left behind” counties. They include most of Louisiana outside of the New Orleans area, much of Missouri between the Kansas City and St. Louis areas, southeastern Oklahoma and patches of downstate Illinois and upstate New York. One exception to this rule: Minnesota, where George W. Bush picked up several fast-growing counties near Minneapolis (but not by enough to win the state). The Republicans also gained territory in the Steel Valley of western Pennsylvania and eastern Ohio, struggling with the loss of manufacturing jobs, and in the “coal country” of West Virginia and eastern Kentucky. West Virginia had been more Democratic than the nation as a whole from 1976 through 1996, but the party’s support for environmental regulations, personified by nominee Al Gore, was too much for the state to take. See a larger version of the 2004 map. Despite a tumultuous first term for George W. Bush, dominated by the terrorist attacks of Sept. 11 and the Iraq War, voting patterns changed very little in 2004. The Republicans added more Appalachian counties, including Charleston’s Kanawha County in West Virginia and Muscle Shoals’ Colbert County in Alabama, plus the remaining holdouts in Oklahoma—meaning the Democrats haven’t carried a single county in that state since 2000. The Democrats picked up a few rural counties in New England and in the West, possibly over opposition to the Iraq War, but most of the party’s gains continued to be in urban areas, including Fairfax County, Va.; Charlotte’s Mecklenburg County, N.C.; Austin’s Travis County, Tex. ; and Indianapolis’s Marion County, Ind. See a larger version of the 2008 map. The biggest counties to flip to the Democrats in 2008 were in California (San Diego and Riverside) and Texas (Harris, which includes Houston, and Dallas), but none of them affected the Electoral College vote. More significantly, Barack Obama carried Hillsborough and Pinellas counties in Florida (Tampa and St. Petersburg), allowing him to narrowly win that state both in 2008 and 2012. Similarly, Cincinnati’s Hamilton County has helped him carry Ohio twice, Lakewood’s Jefferson County did the same in Colorado and rapidly urbanizing Prince William County in northern Virginia has brought that state into the Democratic fold. Even as Obama was consolidating the Democratic vote in major cities and nearby suburbs, the Republicans made further gains in the less cosmopolitan interior, especially in a crescent along the Appalachians from western Pennsylvania to Arkansas. Three counties in the Pittsburgh area—Washington, Beaver and Fayette—were the biggest to switch to the Republicans while the United States as a whole was going in the other direction. See a larger version of the 2012 map. In 2012, Republican Mitt Romney won about 200 counties that had supported Obama four years earlier. Most were in the upper Midwest, which had turned against the Republicans after the economic crash of 2008 but then showed impatience with the slow rate of growth under Obama. Green Bay’s Brown County, in Wisconsin, showed this yo-yo effect, with a Republican share going from 54 percent in 2004 to 45 percent in 2008 and back up to 50 percent in 2012. The Republican share in Berrien County, Mich., in the southwestern corner of the state and with wages well below the state average, similarly went from 55 percent to 46 percent and then back up to 53 percent. The Republican revival wasn’t strong enough in these counties to help swing their states to Romney, but if anti-Washington sentiment continues to grow this fall, Donald Trump may have a chance at winning some electoral votes in the region. Also flipping to the Republicans: Cambria County, in Pennsylvania, which gave Michael Dukakis 60 percent of the vote in 1988 and is the subject of a Politico story on Trump’s possible appeal among former Democrats. Only 11 counties switched to Obama in 2012, mostly in the chain of majority-black counties from Virginia through Mississippi. Almost all are too small to have much impact on state totals, but Obama’s capture of Rocky Mount’s Nash County, in North Carolina, will encourage Democrats to make a serious effort at winning back the state this fall.